I finished Baby R's quilt finally! Remind me to never do a quilt with this many pieces again...or with pieces that finish this small. Uggggggggggggg. Seriously. The main blocks are a design I pulled from my copy of 5,500 Quilt Block Designs - design number 2460, "Rosie's Purina Whirligig." 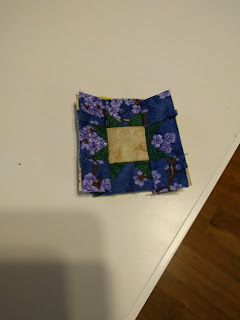 I drafted the alternate blocks myself, with the small squares finishing to .75", and the center square finishing to 2". Again, why do I hate myself? The fabrics in the chain of the alternate blocks are the same as the sashing in the recipient's older sister's baby quilt, though, and I didn't have much of it to work with. It got a little warped hanging over the rocking chair. 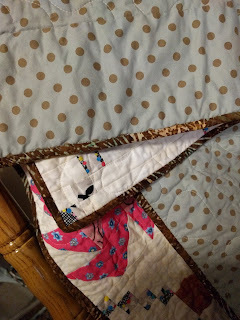 I backed the quilt with a light blue fabric with brown polka dots on it I'd gotten on clearance from Fat Quarter Shop, and just so happened to have a perfect binding to go with it - a brown batik with light blue grass blades on it. I love when my stash comes through for me! Judy over at Patchwork Times isn't doing a stash report link-up anymore, but I really want to keep track of my fabric usage. I made a HUGE purchase at Joann's this week, and while everything has a project to be a part of...it's a LOT of fabric. So I've got to make lots of quilts to get back into the black! 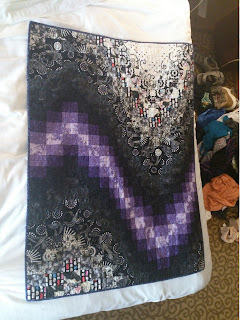 I did finish another quilt this week, but it's currently in the wash so I'll have to blog about it later. I'm counting its yardage, though - I need all the help I can get! Most of what I got was from the clearance rack. 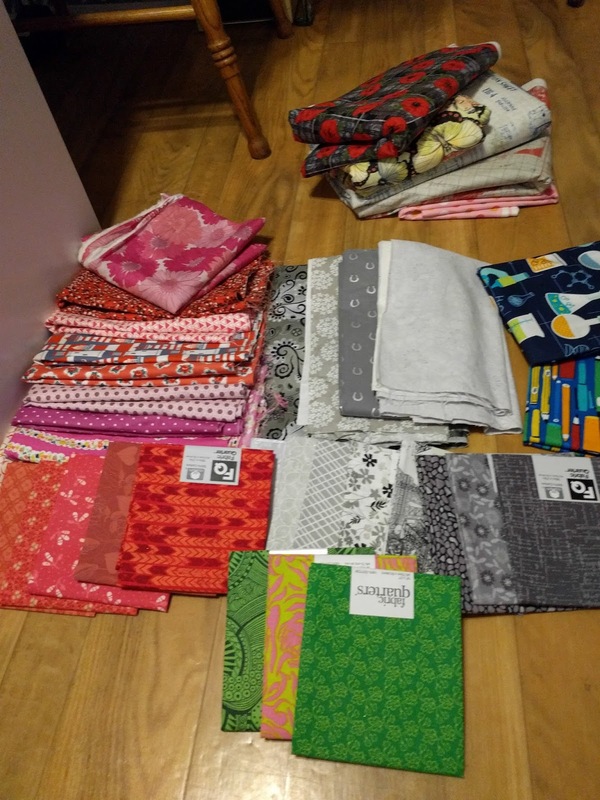 I have 3 distinct themes for my next quilts - a green/pink quilt (the greens at the bottom, and the backing second from the top in the back pile), a school-theme quilt (the two fabrics on the right, and the backing is the third in the pile), and a pink/red/gray poppy theme quilt. I had very few lighter reds, and almost no grays in my stash. This is no longer teh case. And I found the best backing ever - poppies on a gray plaid background. 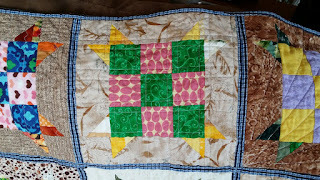 My quilting time is pretty scarce these days but I have been doing what I can when I can (okay, not always...the internet is far too easy to get lost in). But I am making a lot of progress. Baby J-kwelin had a baby sister born on my birthday last year. 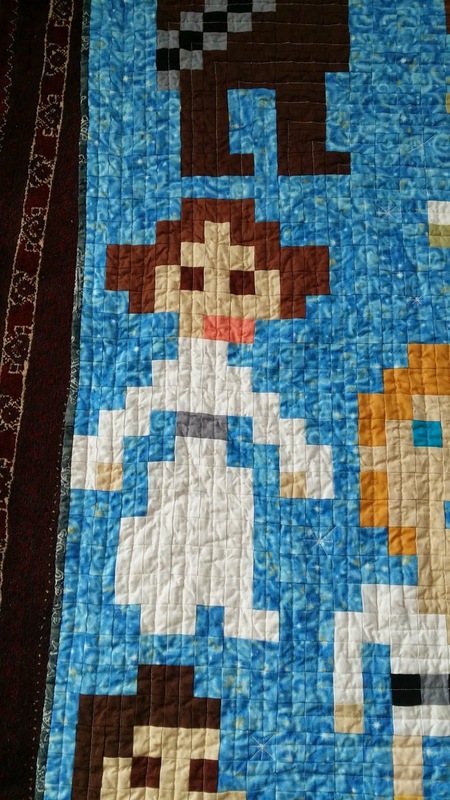 Of course, since her older sister had one of my quilts this little girl needed one too. 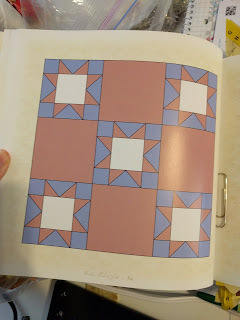 There was a block design in my 5,000 Quilt Block Designs book that actually had her name as part of it, so I picked it and haven't looked back. Funnily enough, this design is VERY similar to J-kwelin's design...like turn four half-square triangles in a different direction similar. 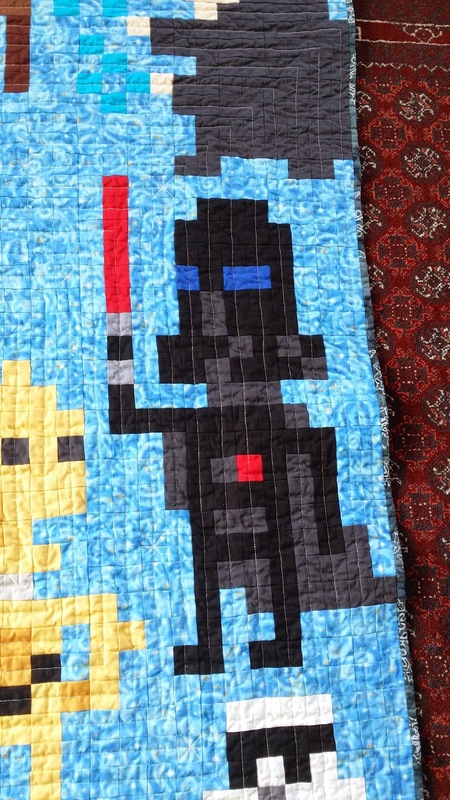 So the sisters will have similar but different quilts. Five blocks to go, then the alternate setting blocks. I love how the design is turning out, even if every block pretty much has at least one place where a point has been chopped off. Seriously, it's a block made entirely of half-square triangles and flying geese. It's going to happen. In other news, I won some fabric two weeks ago (but didn't have time to post last week)! 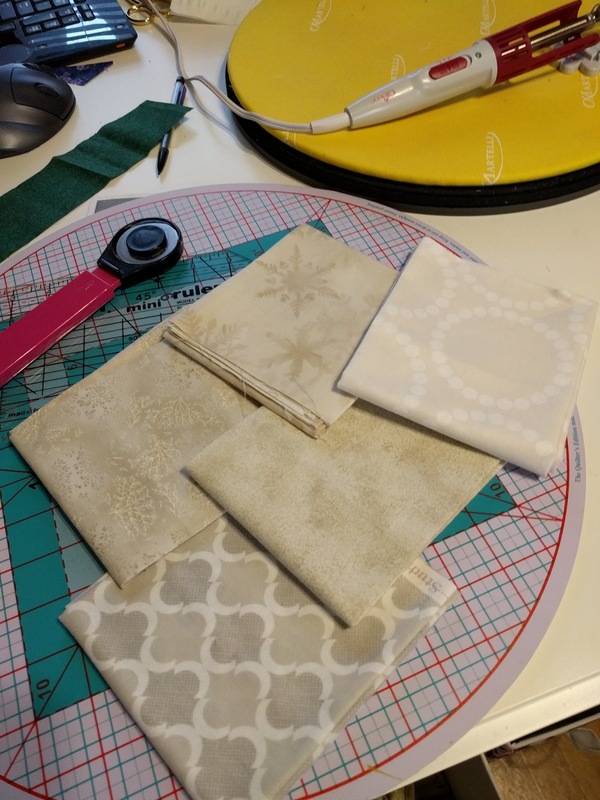 Annie of Annie's Ruby Slipperz had a giveaway for 5 fat quarters on her blog when she recently came back into blogging. I won! I got to choose the color I wanted so I picked *gasp* neutrals. This is what she sent me - they'll be perfect for adding some variety into my stash. I've been using a lot of neutrals. I've changed the colors from what they are in the book on all of these blocks. 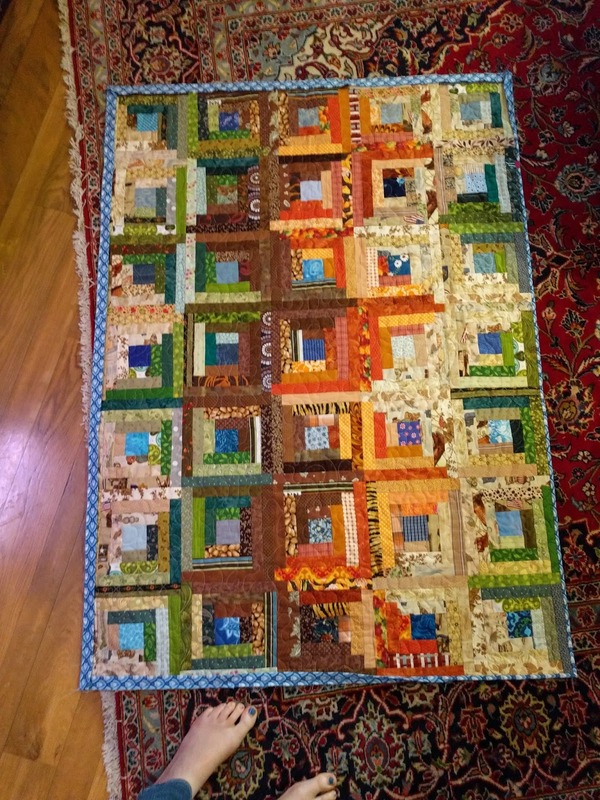 I'm sticking to a similar color scheme as the log cabin quilt from my last post - brown, green, orange, and blue. I'm still in the black! I've got a lot of quilts to make (this one, 3 friends are due in April and May, my neighbor's daughter in law is due in April, and a coworker of hubby's is going to be welcoming his first sometime soon as well) so time to sign off here and get sewing while I still have a chance! 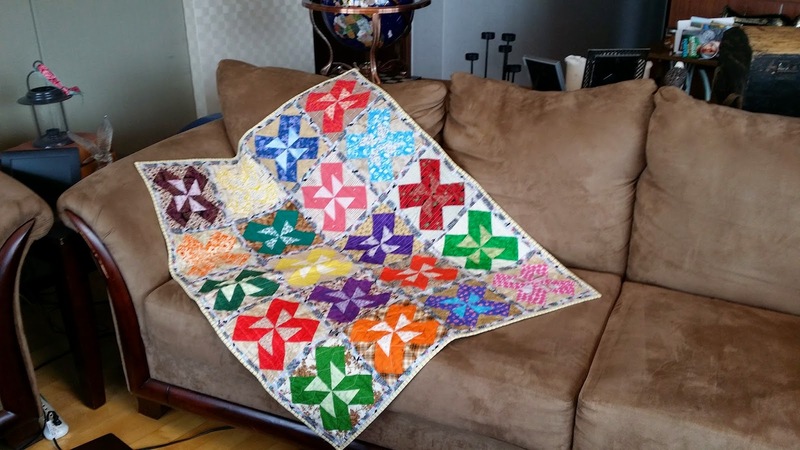 Linking up with Stash Report Sunday and Design Wall Monday at Patchwork Times! I entered my first quilt show! I didn't place, which I pretty much expected, but I had 3 quilts in the show all with my name on them! Aaaahhhhh! 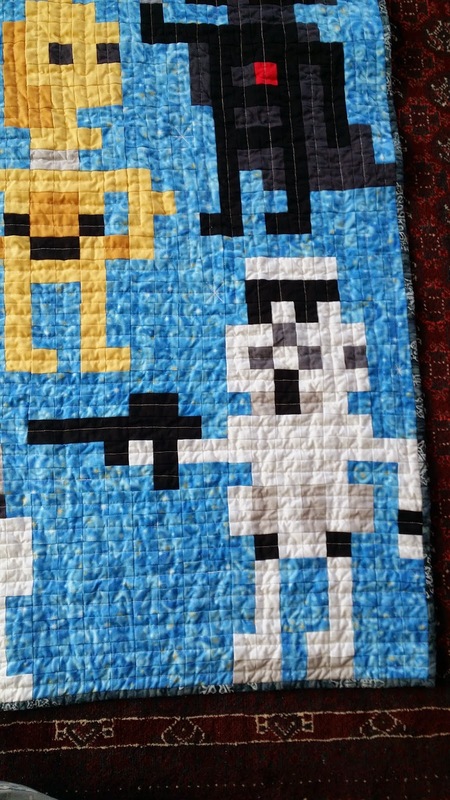 The first quilt was Niece Quiche's Star Wars quilt. My sister was kind enough to send it back to me to put a hanging sleeve on and compete with. The second was for Twig, my one year old son. The top has been done since...um...September? October? I knew I wanted to quilt it on my new mid-arm machine but kept procrastinating because I didn't feel ready to do it. 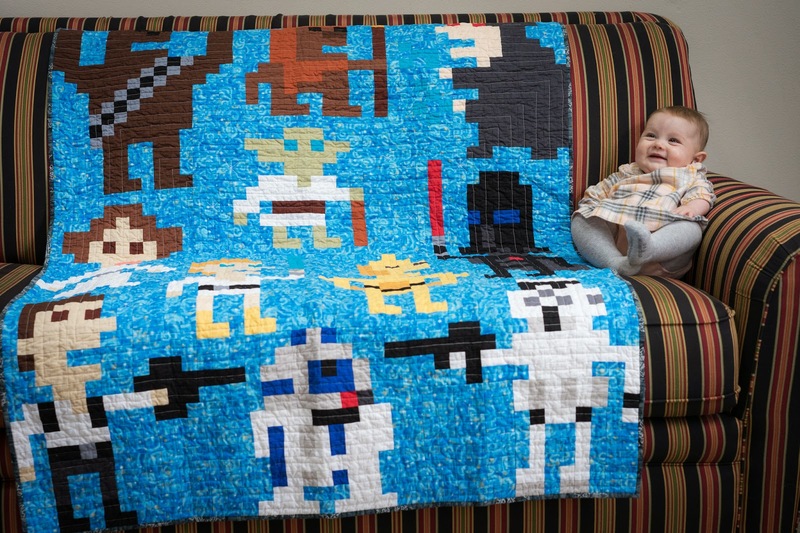 Like I would mess the quilt up if I did it. I spent a lot of time picking out the quilting and actually had the machine break down but the owner of the company that made my machine was very helpful via email and we got it working again. I finished this quilt the day before everything had to be turned in for the show. I called this "Twig Cabin" since we called my son Twig until we decided on his name. The third was for baby H3, my nephew. His nursery was ocean themed so I designed and made this quilt in less than a month. When the mid-arm broke down I immediately switched gears and prepared it for quilting on Jenny the Janome. 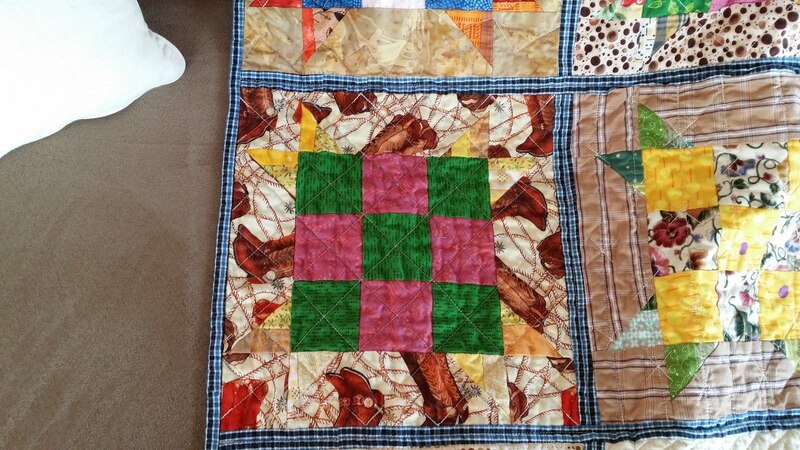 The quilting was simple and pretty fast, and this was finished the day before the show as well. After finishing Niece Egg's quilt, I had two more quilts to work on pretty much immediately. This post will be about one of those. I found out that one of my friends, who we'll call M, was pregnant over the summer of 2015. I didn't know M too well but she was married to a friend from college and seemed really nice. Her husband worked with mine and they rode the bus to work together an hour each way, plus her husband loves playing board games and so do hubby and I. We found out about M's pregnancy after we announced our pregnancy to her and her husband - M and I were due 2.5 weeks apart. M and I started spending a lot more time together. We commiserated about the unglamorous aspects of growing a tiny human, about living continents away from our families, and about our fears and insecurities about becoming parents. M was born and raised in Finland and married our friend, who's an American citizen. As we were all struggling to pick names for our fast-approaching tiny humans we joked that one American way to name a baby seemed to be to find a random word in a foreign language that you think is pretty and use it, regardless of the meaning. We decided to call their daughter Potato; it actually does sound pretty in Finnish - Peruna. Since M was missing Finland, I wanted to do something with the quilt to remind her of it. M is a very conservative dresser compared to a lot of Americans with respect to color. I don't think I saw her wear anything that wasn't black/white/gray/navy/tan until she had to buy a pair of new sneakers to fit her feet as they grew a bit with her pregnancy and the only ones that fit her and were comfortable had pink stripes on the sides. This is where it got really hard. I love color. I have never done a super muted quilt, color-wise. 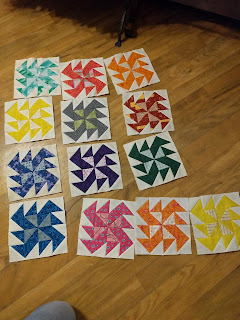 But doing my usual colorful quilt would have overwhelmed M and I didn't want to do that. I asked her what color they were generally trying to stick to with little Potato's stuff and she said purple, so that was the one color I let myself use. I decided to use the Northern Lights as my inspiration for the quilt. A streak of color through an otherwise dark-ish sky would work well for my limited color pallette and would translate pretty well into a quilt. 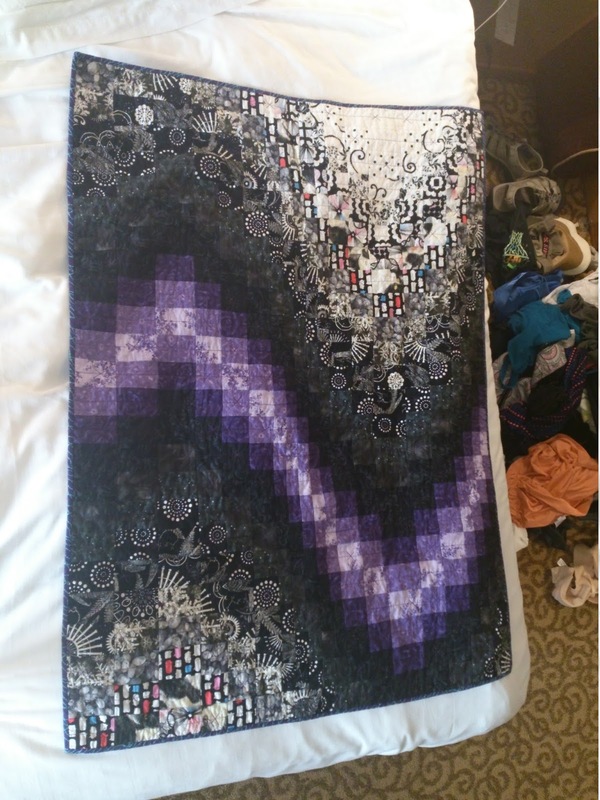 A bargello quilt would work for my intent, but I wanted to go beyond just sewing a bunch of black and white strips into a tube with some purple and seeing how it turned out...I wanted to know how it would look before. In drawing it out I lost a little of the bargello functionality because every vertical strip wouldn't have every fabric in it, but I wanted the stripe to go like that through the center. I also knew I wanted the colors to be in a gradation - the lightest purple would be in the center of the streak, the darkest next to the black and white fabrics. I also laid out all of my black and whites in dark-to-light order so that the blackest fabric would be next to the dark purple. Basically, I took a bargello quilt and made it harder than it needed to be...but when has that stopped me? I didn't get any in-progress pictures because I was pedal to the metal to get this quilt done before we moved. I was juggling having my own tiny human with quilting (and the sewing machine being in the room where tiny human slept so I couldn't work on it unless he was awake) and getting ready to move back to the United States. In the end I messed up and didn't have a good backing fabric for it. I went through everything in my stash and finally decided on a light blue fabric with darker blue ginseng leaves on it, which seemed kind of appropriate since Seoul has ginseng all over the place (unfortunately; they're pretty but the berries smell AWFUL). I also had cut out a helicopter to do my usual label...and it got packed. So I just embroidered my initials and the year on the backing without a helicopter. 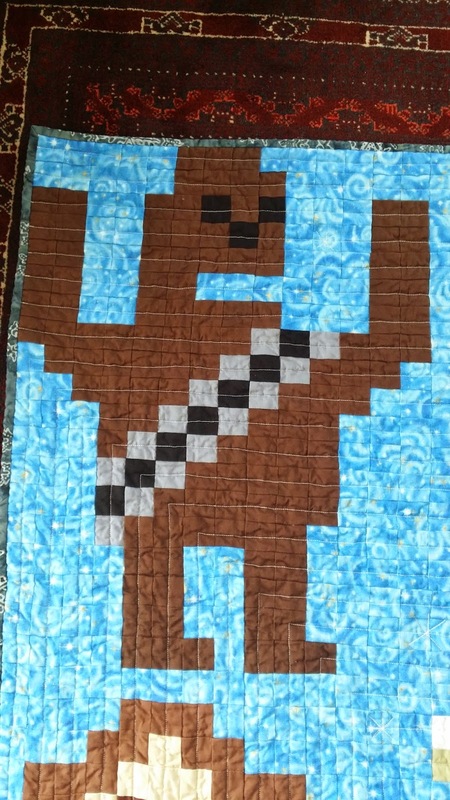 But still, I'm proud of how the quilt turned out. I tied in Finland and Korea for a present to a little Finnish-American baby born in Korea...and that's a win in my book. Please excuse the terrible quality photos - they were taken with a backup cell phone while standing on a hotel bed. The laundry by the side of the bed...well...it's life. But life or not, hotel room living with an infant or not, I finished the quilt and delivered it before I left the country. 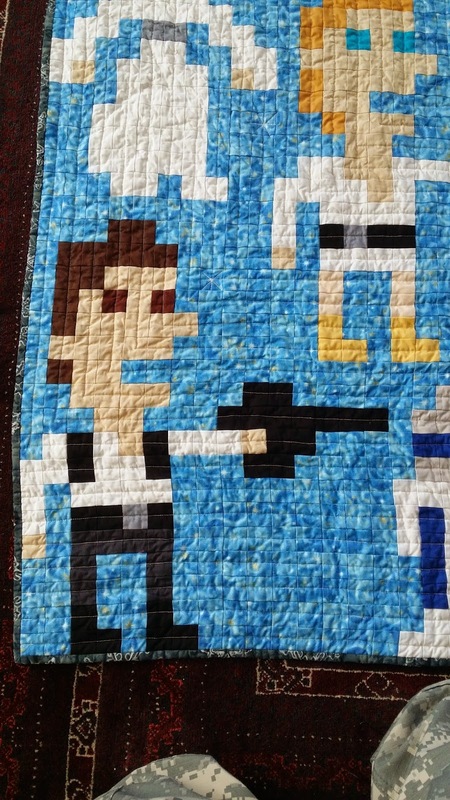 The motion in this quilt makes me smile. Korean-inspired backing on a Finnish-inspired quilt. Fail label. Still mad I didn't save the label from the movers. Hope you like it, it's definitely one of my top few favorite quilts! I just went to my first quilt guild meeting ever last night (I'm back in the US and have a local quilt guild! Eeeee!) and we were making donation quilts, which was pretty fun and took some of the awkwardness out of it being my first time. I had a ton of fun and got more sewing done that night than I've done for a while (more on that later). But the fabric we were making the quilts out of...was obviously donation fabric. Don't get me wrong, I'm not going to be the first to donate my favorite fabric and keep my ugly/old stuff for my own use if I'm donating fabric. But there were some OLD fabrics in there. 1980s calicos and florals old, with a few newer pieces. 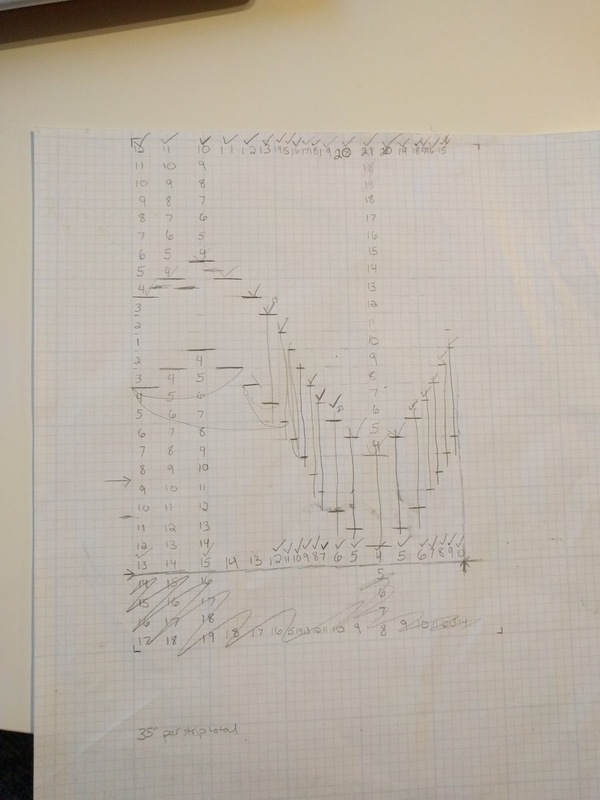 The design we were doing was supposed to have 3 values - there were white squares, darks, and lights. The fabrics we had weren't the easiest to divide up into lights/darks - a lot of them were medium tones, which would've been fine as long as we were consistent with using them as either a light or dark...but people were using them as both and, in one strip set I was handed to use, two fabrics with the exact same background color were sewn together with the only difference being that one strip had navy colored snowflakes on its pale blue background and the other was just a solid. My mom's been telling me lately that she loves my eye for color, as she calls it. I'll be the first to admit that some of my earliest quilts are no longer my favorites - I used a lot of bright colors without much neutral to give the eye a place to rest. 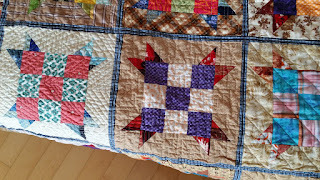 I still love scrappy quilts and make them all the time, but those quilts last night...they looked ugly to me. I'm trying to figure out why I think they looked ugly (I had to leave early so I didn't get any pictures of them) since I love scrappy quilts and enjoy putting fun fabrics next to each other. Floral next to a plaid? As long as the values are right, sure! But something about those quilts just wasn't right for me. I think it's a combination of how the values weren't separated right and the total lack of a color palette. I'm all for rainbow quilts and using all kinds of colors, especially with a neutral like the white squares in our design last night. But there was no thought put into whether the fabrics everyone donated would work well together at all. A lot of the colors were very dated and the blocks just didn't flow well. 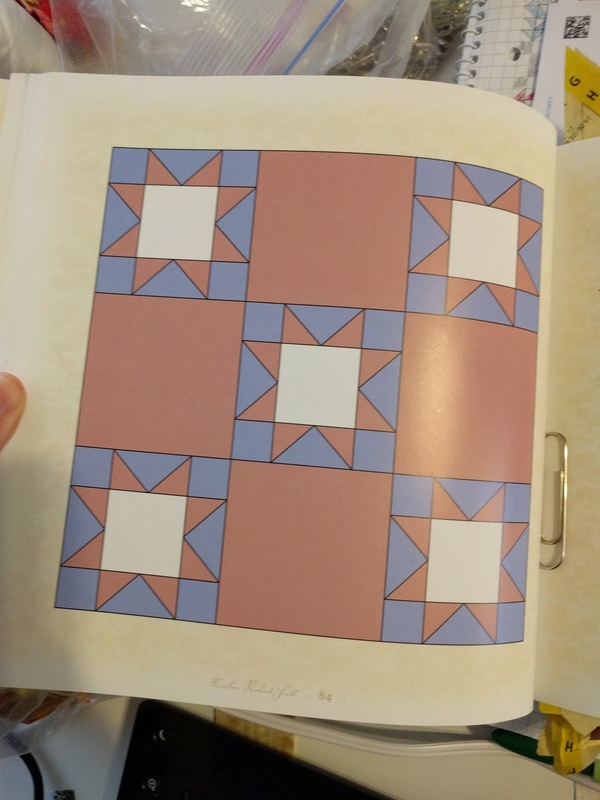 Add to that the fact that a lot of the "dark" fabrics weren't dark (or that some blocks had the dark and light portions sewn in reverse) and the quilt's design just didn't come out. 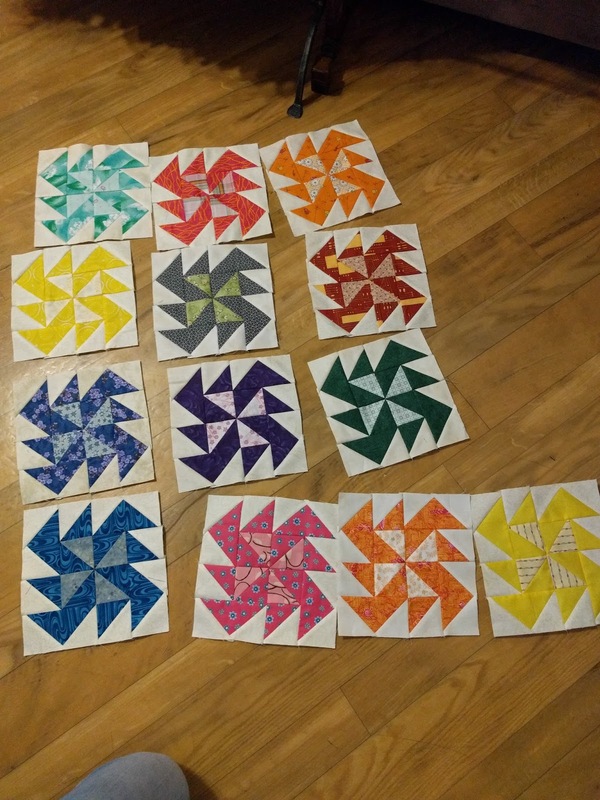 I think if they'd stuck to a color scheme - everyone donate fabrics in these three or four colors - and then used those fabrics to still make a fun scrappy quilt but in a slightly controlled color scheme it would have worked a lot better. Or if they'd done a better job being consistent with darks/lights and had them divided up better within the anything goes color scheme (or cut everything into smaller pieces)...maybe. Anyways. Enough ranting. I've got a lot of blogging to catch up on! 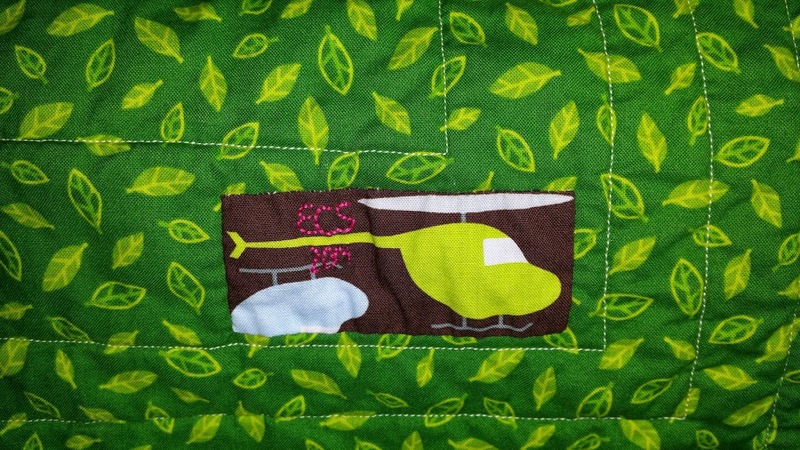 Last post I showed Niece Quiche's quilt. 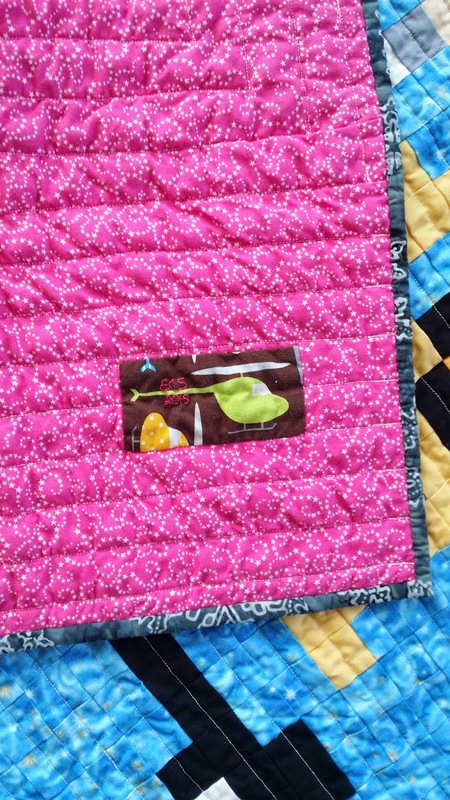 This post will feature Niece Egg's quilt! 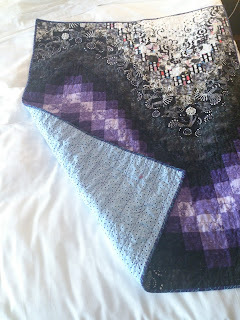 The pattern is Sister's Choice by Bonnie Hunter, though I added sashings and didn't do the borders. This couch has been the setting of many quilt photos. I backed it with Winnie the Pooh fabric to coordinate with their nursery. The binding is more of the sashing fabric, which actually is one of little Egg's dad's old shirts. She and her family definitely appreciated the quilt and the personal touch the shirt added. I'll end this here for now, more updates later (if anyone still reads this thing). 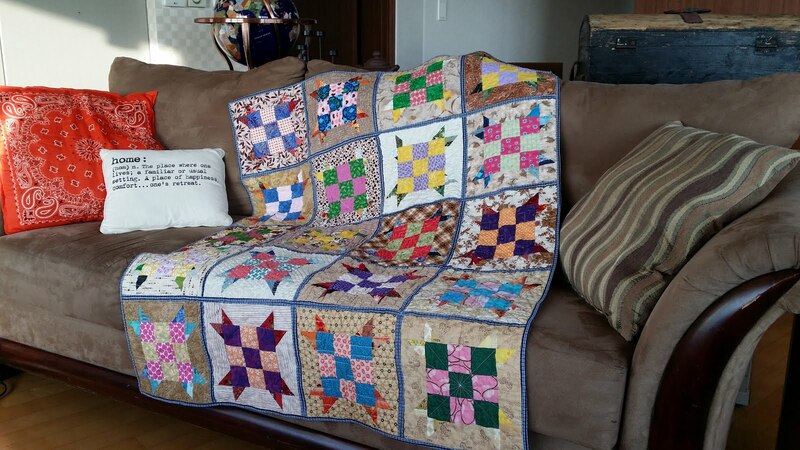 I am very pleased to announce a very special quilt finished for a very special little girl - my neice, who I called neice Quiche in my last post. 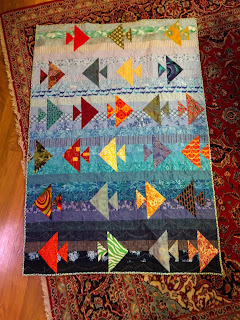 I finally finished the quilt and got it sent off to the wild world of Wisconsin, where it has been very warmly received...and I'm super excited to show it to all of you! Neice Quiche has been very long anticipated and finally arrived this past December (I know, I'm a bit late on this quilt). When my sister found out she was expecting, she and her husband made a deal that allowed him to pick the nursery theme (before they knew gender) and he decided vintage Star Wars. 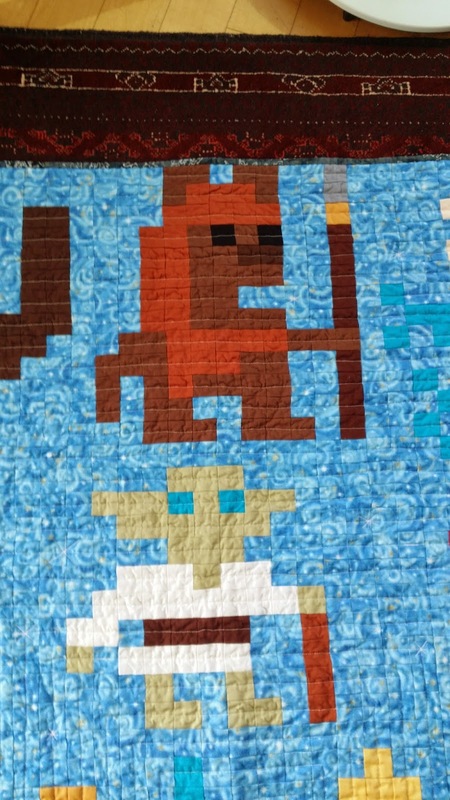 I was SO excited they kept the theme even after finding out they were having a little girl...and so I got around to designing a vintage Star Wars baby quilt. 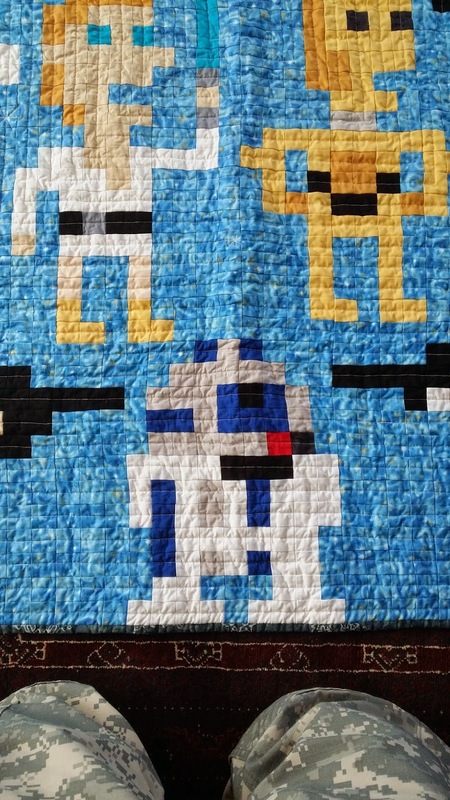 I did a quick search on Pinterest for Star Wars Quilts and found a pin that linked to Andy Rash's Star Wars pixel art and I was totally hooked. 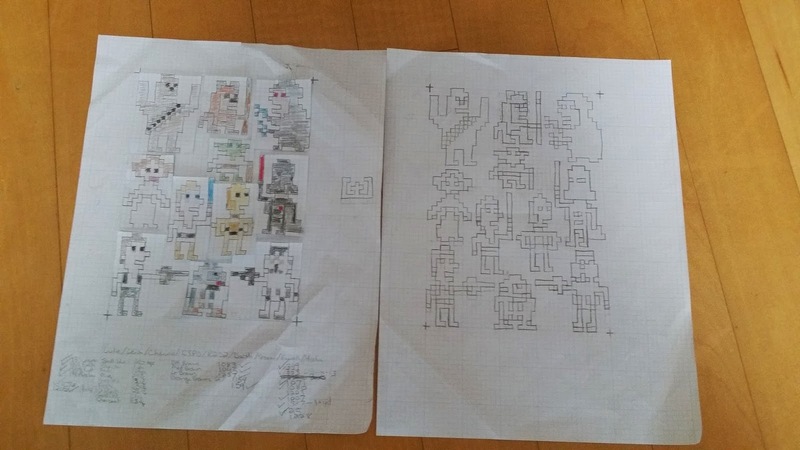 I drew the characters on graph paper, cut them out, and moved them around until I liked the design (with the hubby's help to try to make them all fit). 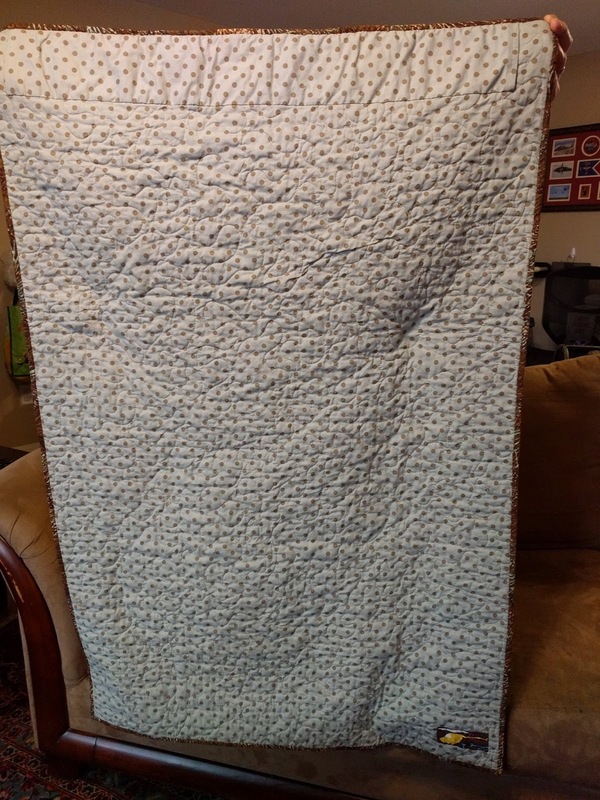 I had decided on 1.5" strips unfinished/1" finished and the size had to fit on the Warm and Natural crib-size batting (package says it's 45x60). Left: the colored-in cut-out pieces; Right: we re-drew them to make it easier to sew from, but coloring was too tedious. At first, I was afraid of the design - the characters had enough overlap between them that I was envisioning Y-seams and other terrible things (hey, I hate them...if you can do them, the more power to you! )...until my husband pointed out that I could just make blocks of a fixed size and the characters would still come together in the end. Duh! 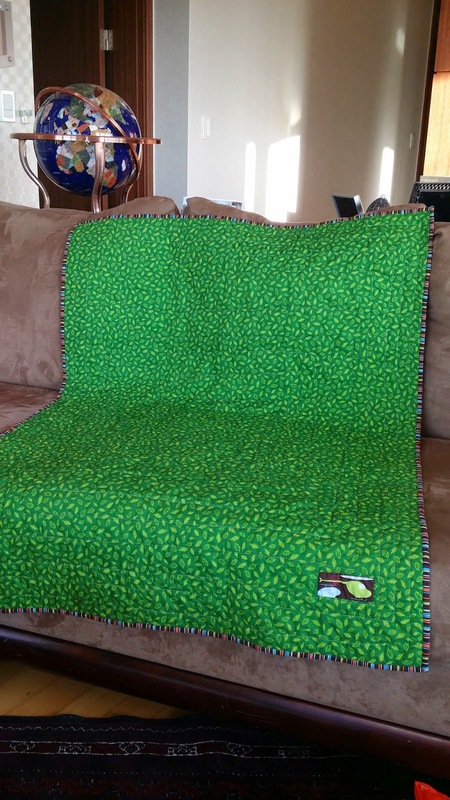 To make the quilt as best I could, I used my Go! Cutter to cut 1.5" strips, then sewed those strips into the most common strip pairs I'd need for any given block. I then sub-cut those strip pairs down into doublets - two 1.5" squares sewn together, not pressed. I pressed the top seams of each block to the left, the next row to the right, etc. so they would nest well; waiting to press the sub-cut seams helped all of that lay nice and easy for me. Overall, I definitely bought too much of the solids, but they'll get used in the future, I'm sure. 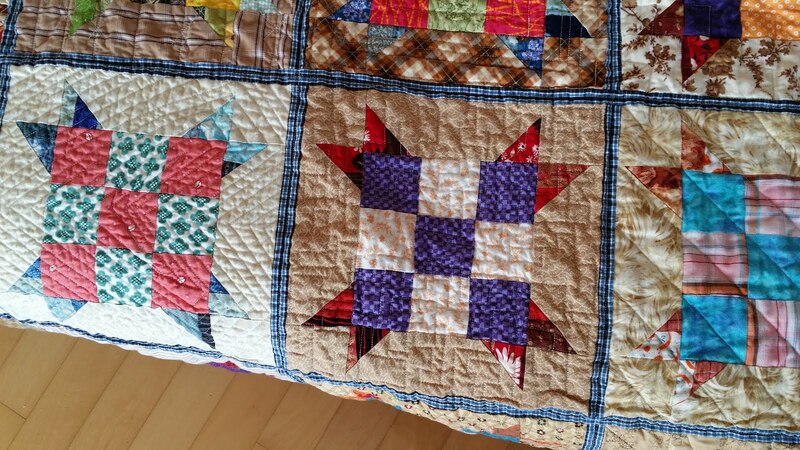 This quilt was fun, if a little finicky to get all the seams to match. After all, it contained 2,240 squares in total, and getting that many to match up...isn't necessarily impossible, but definitely difficult. The backing was Timeless Treasures Fairy Tale Mini Stars Fuschia. I bought 3 yards and it worked well - I had a few strips left over from each side of the quilt but not too much. To bind the quilt, I opted for a navy batik with a snowflake design left from Texas Mom's 4-Seasons quilt. I think I got it from Fat Quarter Shop, but I'm honestly not positive because it was bought in 2010. I picked this print because neice Quiche is a December baby, and my sister's wedding was in December - her colors were blue and silver and she had lots of snowflakes in her decorations. I liked that the binding tied that in there subtly. I quilted in a squared-off spiral so the quilting would go through every square of fabric (gotta help reinforce those seams for baby quilts - they'll get spit up on and need to go through the wash!). 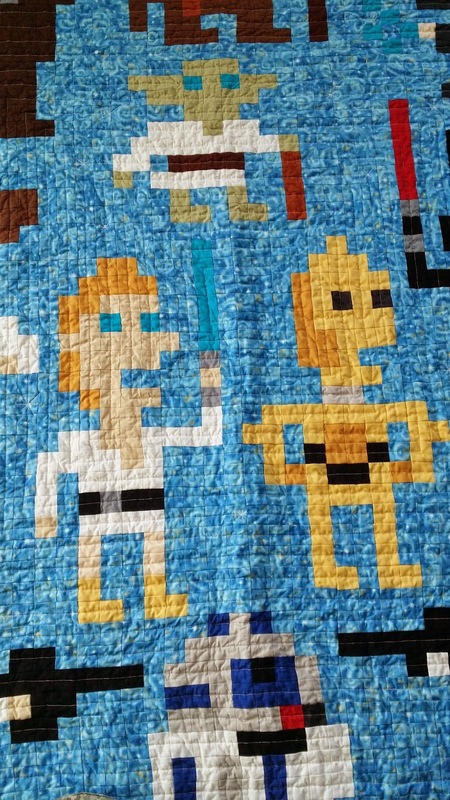 I randomly quilted a few stars throughout, as you can see in the character shots below. For the two ends of the quilt, I just quilted straight lines (the rectangle meant that I ran out of width to quilt before I ran out of length) to make the eye think that the spiral was still going. The whole front - isn't this fun? Chewie yelling - I love his ammo belt! Emperor Palpatine; it's hard to see the magic sparks coming out of his hands but you can if you click to make the picture bigger. She looks a little awkward, but at least she has the cinnamon buns! Luke and C3PO, who is appropriately in the middle of the fight, probably trying unsuccessfully to calm everyone down. Luke's light saber and eyes are the same color as the Emperor's electricity. R2D2 in the middle of the fight, right where he belongs! I absolutely love the location of the characters. The droids, just like in the movies, have managed to get in the middle of the battles. Luke and Han are both trying to protect Leia, Chewie is throwing up his arms and doing the noise he is so known for, and the Ewok is getting into trouble as always, unaware of how tiny he is. Yoda is even almost standing on Luke's shoulders. Net for 2015: 0 yards added - I'm even! Wahoo! I wish I could just write *insert witty opening line about not having posted in years here* and have one appear but, alas, life doesn't work that way. Instead, it moves on and before you've realized it has been two years since you even looked at your blog. Go figure! My quilting has been much slower lately. Since my last post (seems ages ago, really!) my left shoulder hasn't improved, unfortunately. I have had two surgeries on said shoulder, which has put a big damper on rotary cutting. I'm now still dealing with that shoulder's issues (how am I this broken? I'm still in my 20s!) after I fell off my bike on ice and landed squarely on that arm. My latest MRI shows that I have what appear to be small tears in my rotator cuff and possibly some scar tissue growing through some of the tears. I'll find out in late February if I'll have to have another surgery. I had resisted getting a Go! Cutter until a couple of months ago, when I finally decided that enough was enough and I was being utterly ridiculous. I bought the Go! regular with a 2.5" strip die and a 1.5" strip die (the value die came with it but I haven't used it yet). I love it...absolutely love it. It's easy to use and I get so much more cutting done. Up until fairly recently I had been able to do some rotary cutting but was noticing that I was having more issues with reliability of those cuts. I'd slip at the end of the cut and it would be just a little too big or a little too small, but usually enough to swag and make it work. Getting the Go! has completely eliminated that issue for me, and my 2.5" strip bags are quite healthy. I haven't had any issues with the fabric being distorted with my cutter, though that could have more to do with the fact that I'm using the strips and not any of the shapes. One of the rubbery feet on the bottom of the center of the cutter has fallen off, but mine gets folded up and moved around fairly often so I'm not too worried about it. I wasn't expecting how much static electricity it produces, but it's not really a problem, just a minor annoyance. It might happen less during the more humid summers, we'll see. Lately I haven't been able to rotary cut at all, though, so I've gone back to the old days of quilting...drawing lines and cutting pieces with scissors. The Go! cutter is great for making me strips, but I don't have every die and when I need a 2.5" by 6.5" rectangle I can't make it with the dies I have. 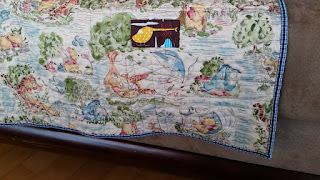 Rotary cutters were around when I started quilting, but the nice lady who taught me (whose name, unfortunately, I have forgotten some 15 plus years later) was a template woman. 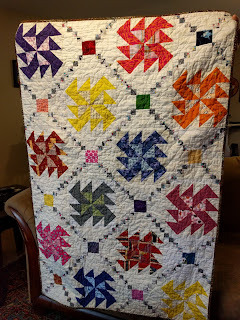 She had somewhat opened to the idea of a rotary cutter to add a seam allowance but she would trace her template and then use the rotary cutter to cut .25" away from her line. She and I both hand pieced back then, so the line was necessary to know where to sew. 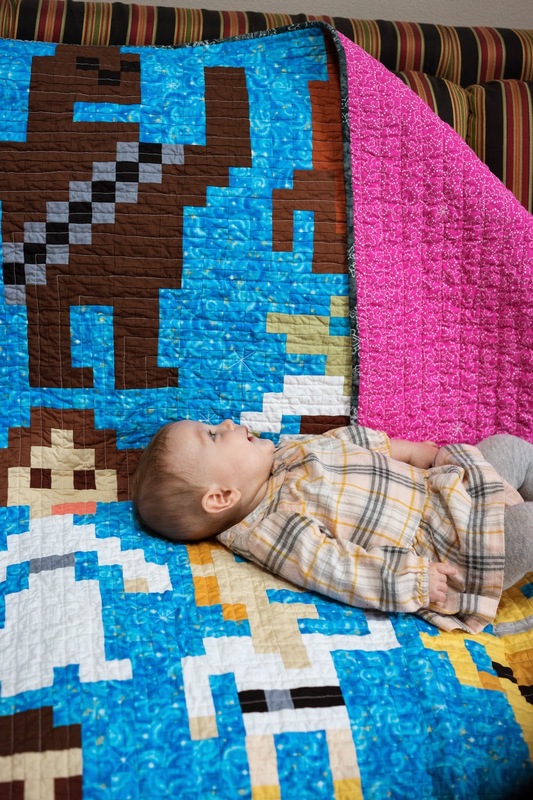 I became an Auntie recently and, unfortunately, that quilt is still in progress and a secret. 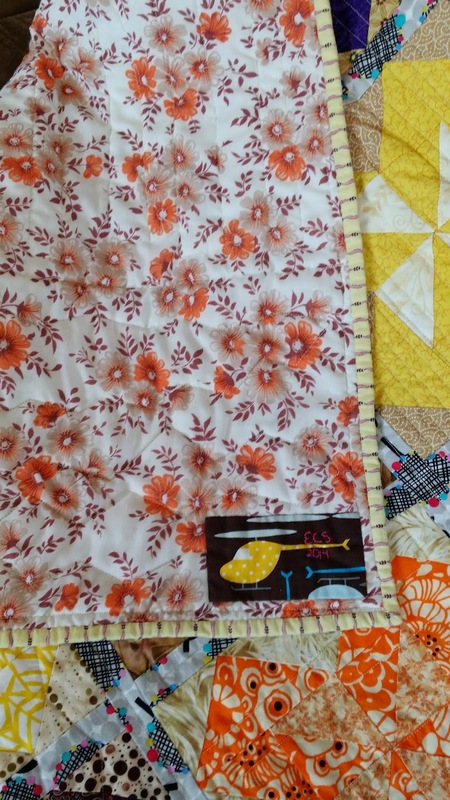 I've got another neice on the way soon but her quilt is only a few blocks that are now on hold since baby Quiche's quilt backing finally arrived (names obviously changed for privacy!). The quilt is not quite halfway done with the quilting. My most recent finish has been for my friend's baby. Baby J-kwelin (it's an inside joke) was born in September and I was able to finish her quilt in time! Her nursery colors are yellow and gray. 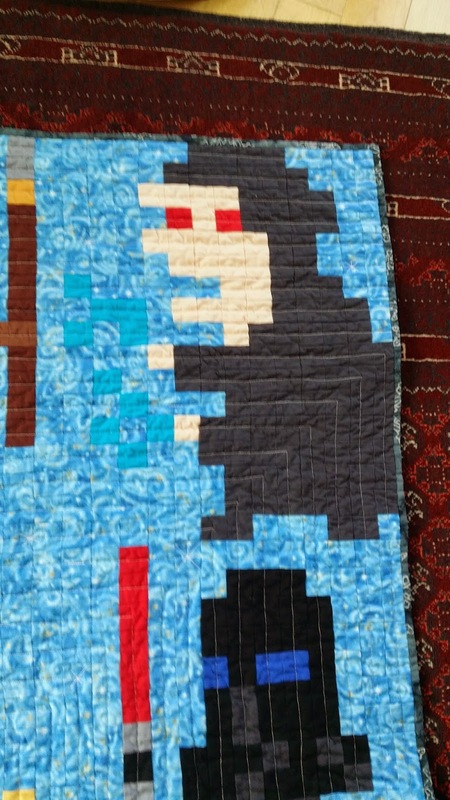 Her quilt was Bonnie Hunter's Jack in the Box pattern, 4 by 5 blocks with .75" sashing. 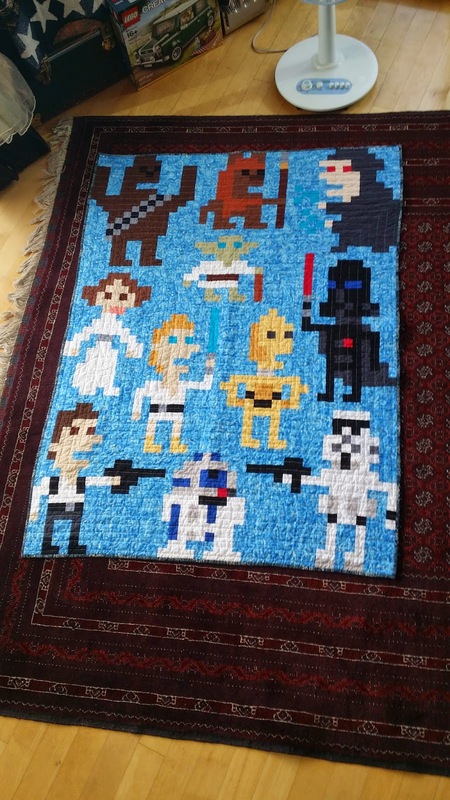 It was a fun little quilt to make. My blocks were a good chance to play with color theory a bit. I found I am not very good at finding "light orange" in my stash, since those color combos invariably didn't read well value-wise. I also started playing with varied neutral backgrounds, though I'm not as relaxed as Bonnie is (each block had the same background, not mixing and matching like Bonnie's quilts usually are...also, all stayed well within the tan color family). I quilted it in rows since the blocks had been made over a long period of time and weren't exactly the same size. My other finish recently was for baby Jorgito. He was born in August and he's the most serious, studious baby I've met. I used string blocks for his quilt; his nursery was green and brown, hence the color scheme of the quilt! Oh look...it's my couch again! I love the backing fabric. 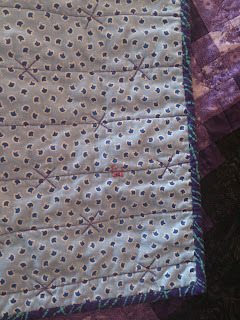 The binding for this quilt was actually leftover bits from Baby S's quilt a few years ago. The brown/orange/blue/green/yellow stripes really looked nice with the colors on the front of the quilt. 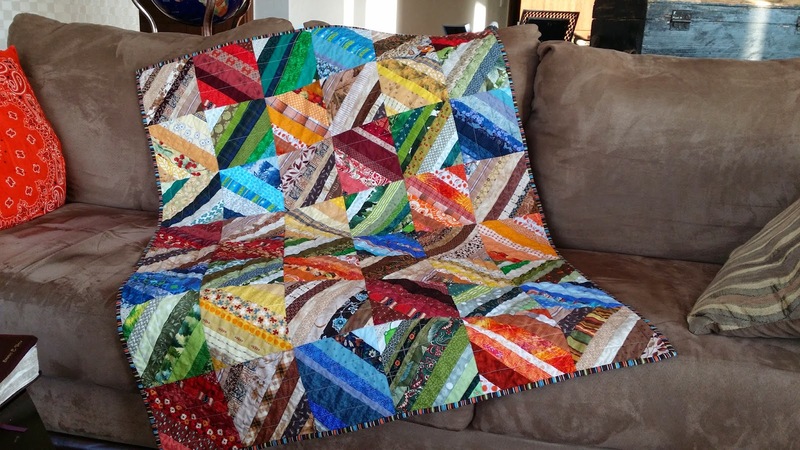 I had just enough of the stripe (in the direction it needed to go) to do this quilt with about 8" leftover. Stash for the win! 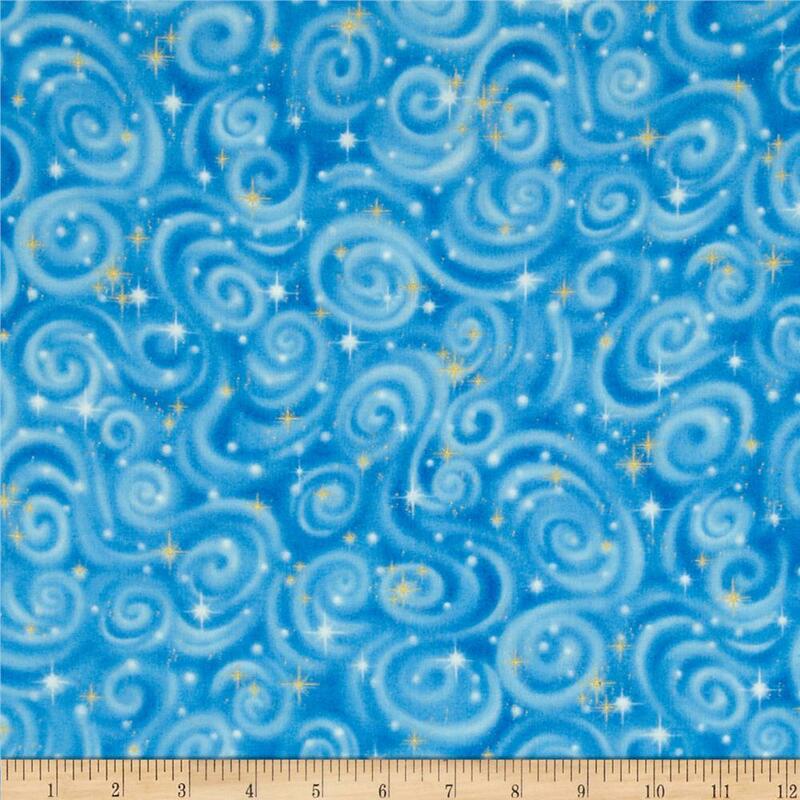 That's enough for now...wrapping up with a link back to Judy L's fabric report! Nothing finished so I can't count anything used yet. Drat! By way of explanation: all added yardage is backings for the two neice quilts. My goal is to use 50 yards this year. Quilter, hermit crab enthusiast, wife, mother, and follower of Christ. Follow the daily lives of my hermit crabs at The Daily Hermit.